That was interesting. 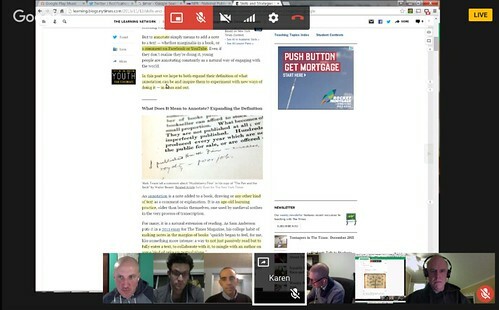 Last night, I followed an invitation of my friends, Terry and Joe, and took part in an online annotation Flash Mob experience, where a bunch of folks mostly used the tool Hypothesis (a browser add-on) to close read and annotate a New York Times article … about annotation. But the act of annotating an online article together, as a crowd, is always an interesting experience. There are a lot of tools out there to do this, from the comment feature in Google Docs to Genius to Diigo and more. Hypothesis is a nice tool, clean to view, and if the tool is activated, when you come to a page that someone else has annotated, it allows you to view and comment and add to other people’s annotations. You can also add images, video and animated GIFs. It saves your annotation into your own “home” stream. 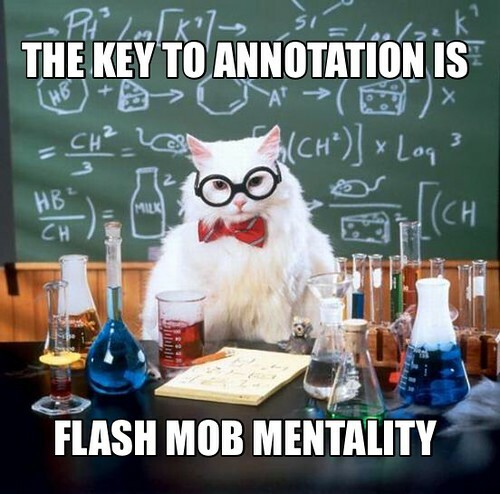 The way the Annotation Flash Mob worked was a bunch of us hung out in a Google Hangout, talked about annotation, and then got to work — all the while talking through the annotation process and screen-sharing what we were doing. Well, I found I could not really talk and listen closely, while also reading closely and annotating, so I sort of found myself in my own little cloud of thoughts for a big chunk of time. There was a bit too much “noise” for my brain to handle, but I did the best I could to listen, read and write. For me, the best part was the end, when we stopped annotating and starting talking reflectively about the implications of this kind of online annotations for learning in the classroom. Ian talked about having students in his college courses annotate the syllabus with suggestions and comments. Joe talked about the power of the crowd, coming together on a single document (apparently, that is going on tonight with the State of the Union speech) as an example of social networking. Jeremy (of Hypothesis) talked about (or wrote about) how teachers can keep track of student work, and the article references how this might fold into student learning portfolios. Terry noticed Karen working all through the hour, and talked about how one might video-capture with reflection the act of annotation as a way to show your learning and thinking. Remi noted how this kind of active annotation might have more value than Twitter chats and other social gathering activities, where too much affirmation and cordiality might soften some deeper learning and sharing of insights. Many of us, including me, wondered, as voiced by Terry, So now that you have all this “noise” of annotation, how do you find the signal? How do you curate your annotations, and your crowd’s annotations, into something useful that moves beyond that single moment of time? We did not have a solid answer, except to note that teaching the art of curation is getting relatively short-thrift in a lot of our classrooms. Ian noted that by not teaching curating, we are missing an opportunity and important skills in the information-rich Digital Age. This entry was posted in CLMOOC, nwp, Technology Resources. Bookmark the permalink. The going back over and sifting is the semi-tough work that reflective teachers, researchers and scholars are committed to. And it is daunting. That space last night was a real time travel moment for me. It was the moment I had been striving for since 2006 when I opened up my Diigo account. I know that we have played this annotation game for years. I feel like I have been trying to drag others into this game for at least ten years. Last night I felt vindicated and I felt all of our aggrgated back-and-forths were vindicated. Probably didn’t know it was such a big deal for me, but it was. Sweet Yeti of the Serengeti! antispambuffooneries: wave ideas I was warned about the ides of March, but it just seemed like another crazy soothsayer wavy idea…until I saw the knives come out. And yet … we still have miles to go … I can’t articulate it, and could not last night, the sense that none of these tools yet fit what I need to make sense of the world. It continues to be this quilt-like approach — use this for this, use that for that, and then try to figure out how this fits with that, and how that informs this … we lose a lot of educators from the first step when that happens, and when we lose the teachers, we lose the students …. small tools loosely joined, the curse and joy of the Web. I’ve just finished watching the Google hangout and am reading the various blogs and threads that have resulted. I think teaching this from the classroom is really important, because there is a “glue” that motivates the students to dip their toe in the learning. Trying to get adults out of the classroom to connect around the SOTU or a newspaper article, if they are not already self-motivated, will take much longer. Thus, you’re creating a new generation of leaders and problem solvers. I’m happy to follow along. I appreciated your reflection and the critical questions you’ve posed. I placed a few hypothes.is annotations in the margins here if you want to check them out and respond. > if you want to check them out and respond.